Top quality products and both maximum delivery reliability and cost-effectiveness. For us – and our customers – these are the decisive criteria to which all our manufacturing operations are aligned. That is why, in the past few years, we analysed our internal operations down to the smallest detail and optimised them according to the principles of lean management and production. This included the systematic launch of a synchronized continuous flow production in a 1-day cycle as well as work planning on an hourly basis. These measures have led to a sustained improvement of material flow and a marked reduction of cycle and processing times. As a result we have been able to improve our delivery times even further. Every one of our employees has benefited from these optimisation measures as well, as work stations were redesigned based on ergonomic criteria. 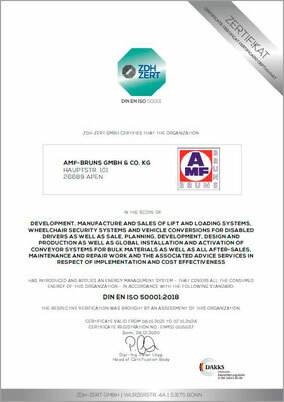 Some years ago, we also introduced a DIN EN ISO 9001-based certified quality management system that covers our whole design and manufacturing operation and contributes to the constantly high quality of our products. Climate and environmental protection have always been a prime concern at AMF-Bruns, which is why we consider environmentally relevant factors in all our corporate operations. The result is consistent environmental management that contributes to saving natural resources and protecting the environment. Since 2013, for example, we have been using electricity exclusively from hydroelectric power and also procure a portion of the gas we use from renewable sources. We are also actively involved in improving sustainability in other areas – for instance in logistics. Alongside a marked reduction in the packing materials used, we have also been using thinner films for some time now, which enables considerable reductions to be made. Furthermore, only resource saving recycled paper is used at AMF-Bruns. To make sustainability an active part of our corporate culture and for a liveable future in an intact environment, we also regularly prompt our employees to actively integrate environmental protection into their daily routine and to bring in fresh ideas to make operations at AMF-Bruns that much more resource saving.